Begin at the Campground parking area, ride the blacktop path for about 150 yards and Scenic River Trail will go off to the right in a left hand turn in the blacktop trail. Note a wooden bridge just in the woods. Follow the white diamonds. This trail will meander through the bottom land for about a mile and then cross Ohio Rt.7 and climb a pretty steep climb with several switchbacks. Believe me it is worth the climb. After the tough climb you will be rewarded with some awesome singletrack that flows up and down the ridge out to Co.Rd.9. You can turn around there and ride back for a 7 miles quick evening ride, or cross Co.Rd.9 and continue on the NCT connector for another 3.5 miles till the connect with Archers Fork Loop / NCT. Turn around there and ride back for a 14 + mile out and back. Be careful on the decent down that steep switchback laden hill overlooking the mighty Ohio River. There are a few slightly technical places on this trail but lots of flowing singletrack you can fly on. What a great trail for beginners. If you are a beginner I would suggest getting the directions to the County Rd. 9 parking and ride out to the steep hill (with switchbacks) and just turn around there and ride back. No real difficult climbs or techy switchbacks to deal with. If you really feel froggy, you can begin at Leith Run, ride across Co.Rd.9 on the connector, turn right when you hit Archers Fork Loop and ride it counter clockwise till you come back to the connect (lollipop style) and then back connector and Scenic River Trail for about a 24 mile killer ride because Archers Fork Loop is up and down, and up, and down, and up and down all the way around. Check out the description for Archers Fork with the Cave and Natural Bridge. Review: Hey everyone, we have reopened the Scenic River Trail Loop. A 7 mile trail that connects to the Scenic River trail near both ends. It is awesome ! I'll send in the gpx file so it will show on the map. If you ride from either end and do the loop it's a tough 10.5 to 11 mile ride. Similar Trail: Ohio View, Ohio View Connector, Archer's fork loop. Review: Note, if you start from Leith Run Campground the climb is not as bad as it used to be. Mostly rideable. Several of the switchbacks were taken out and the trail made more rideable last year. Much better than before. I just rode this a few weeks ago and did a loop using this trail. When you reach the end of it at Co.Rd.9 you can continue on the North Country Trail ( a little tough ) and connect to a portion of Archers fork Loop. Follow the loop across the gravel road from the NCT for a couple valleys and watch for the Ohio View Connector. Go right here and ride over to Co.Rt.9. Cross CR9 and climb a steep hill and on the other side connect with Ohio View Trail where you will take a right and follow it to the end. It will come out at Beavertown about 3 miles north of the campground you started at. Just ride down the road to the camp. Is around 25 miles. Similar Trail: Don't forget to hit the Marietta City Trails, Strouds Run, Sells Park, Lake Hope, and nearby just across the river in WV, Mountwood Park and North Bend State Park. Review: All the trails in the Wayne National Forest will be open again after the 16th of April. Negotiations are in progress to remove the trail fee for mountain bikes. I'll post more in a few weeks. Similar Trail: Ohio View Trail, Archers Fork Loop, the connector trails along these and the City Trails in Marietta. Review: Sorry, I always seem to forget to mention the opening dates and the trail pass. 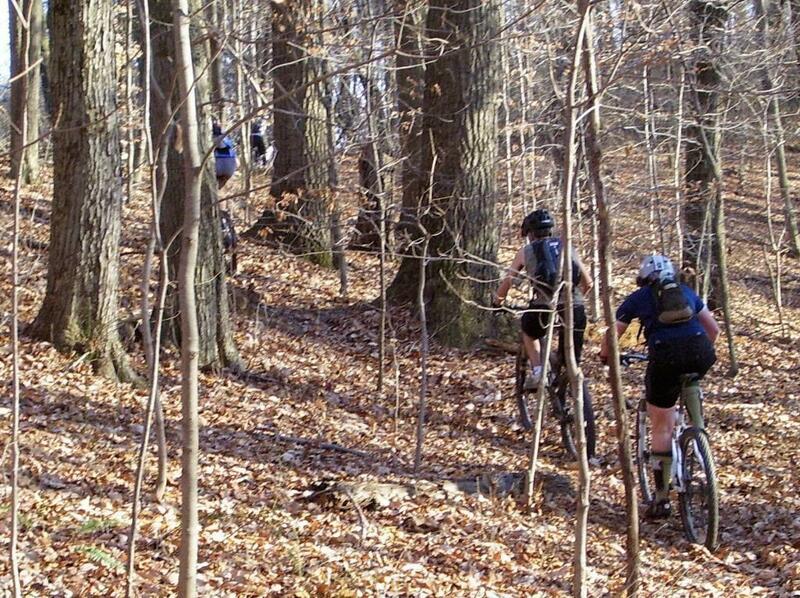 Note: The trails in the Wayne National Forest open April 1st and a trail pass is required to ride in the Wayne. Be sure to get a trail map when you get your permit. Similar Trail: Ohio View Trail (3 miles north of this one), Archers Fork Loop, and North Country Trail connectors. Can't forget the Marietta Ohio City trails. Scenic River Trail MTB Trail 4.60 out of 5 based on 5 ratings. 5 user reviews.